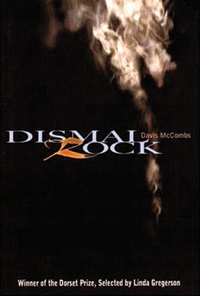 This collection of poetry by Davis McCombs uses the language and terrain of the burley tobacco country of south-central Kentucky to reveal the complexities of a fading way of life. It received the 2005 Dorset Prize for poetry. The Dismal Rock of the title is a massive sandstone outcropping in Edmonson County, Ky. In McComb’s work, it looms as a place and a place name, sometimes outlined with snow, sometimes defining the horizon. At times it is the site of loss, as in “The Last Wolf in Edmonson County,” which refers to the shooting of the last gray wolf in the area at the base of Dismal Rock.